What do you do with an extra box-spring? Why, you make a 'Princess & the Pea' bed, of course!! 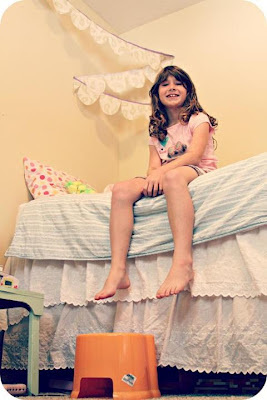 Little Pazely has to climb onto her bed with the aid of a stool. Which she thinks is pretty awesome. And I don't have to bend down as far to give her goodnight kisses & snuggles. Can't wait to come up with fun headboards for all of our rooms. The Mr. & I have never had a headboard or a proper pretty bed. I seriously am itching to create. I have 2 more rooms to unpack before I can attack my art studio, the last room in the house to organize. The parentals & the grandmother arrive in 9 days. I'm so excited! I can already smell the coffee they'll be making every morning, & picturing them puttering around in slippers & bathrobes & jammies in the morning, all glorious with their bed heads & tired beautiful faces. I can't wait to play card games in the evenings & do some discovering in the days. I already know we'll be cooking meals together in the kitchen & my dad will ask what fix-it type things he can do to help around the house. (I've already got a list started for him.) Mostly, I can't wait to just sit & visit & laugh our heads off.